(Note: I don’t name names in this article, but if you’ve been in the wedding industry for while, you will know who I am referring to. If not, you really do need to read this). 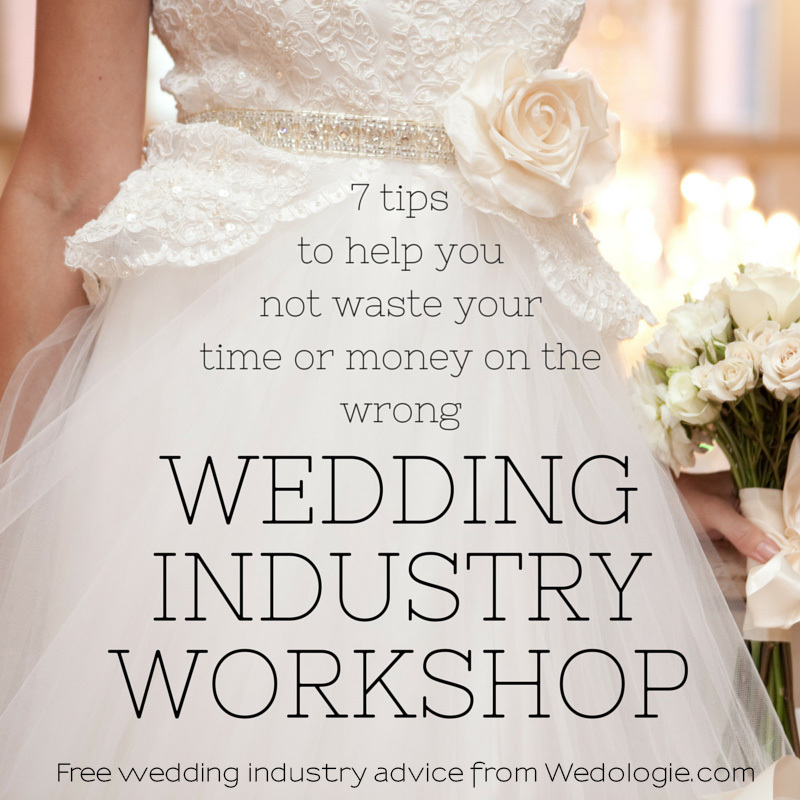 A wedding industry workshop can be a fantastic way to learn and help your business grow. Industry leaders can share information that they have gathered over the years, distilling it that knowledge into a valuable seminar or workshop. Great education can save time on the learning curve, and save you from making big mistakes. Unfortunately, for every great educator out there, there are 10 people who have absolutely no business teaching. 1) Go back in time… Thanks to Facebook timelines and blogs you can see exactly how long a wedding pro has been in business and what they have accomplished. 2) Do the math… If an expert is claiming that they do 40 weddings a year, how exactly do they have time to do a 37 city tour? Are they flying home each weekend? If they are, kudos to them, but I wonder how well they can be serving their clients with this kind of schedule. 3) Google their name and (sadly) the word “scam…” This isn’t pleasant, but if others are posting that the workshop was a “rip off” or wasn’t worth their time, tread carefully. Sometimes their competition will post false reviews, it happens, but reviews should be taken into consideration before you invest hundreds or thousands in someone’s program or workshop. 4) Look for experience and longevity… I didn’t seriously consider teaching or doing business coaching until I was sure I was done pursuing weddings. For me it was a matter of timing and wanting to have the experience under my belt. And yes, there are people that can and do successfully balance a full time business while teaching, but in my opinion, they are a rare breed. Phrases like “in 2 short years we were booking more work than we could handle” gives me anxiety. How much could they really know in just 2 years? I was overbooked my first 2 years too, because I was massively undercharging and had zero balance in my life. I was working too hard for too little, and I didn’t know any better because I was new to the industry. 5) Outrageous claims… Yes, some professionals make 5, even 6 figures per wedding, but probably not on every one. They claim they never provide discounts? Maybe, but every wedding professional I know is usually happy to extend a military discount or maybe they throw in a little extra something to close a contract. I never would have reached any level of success if I had been completely inflexible on my packages and pricing. There were some clients that I just loved, so I found a way to make it work. I also see tons of “professionals” promoting their workshops and seminars, claiming to be “fully booked,” but a few days later I see them complaining on social media about newbies undercutting their prices and taking work out from under them. That doesn’t sound “fully booked” to me. 6). Financial woes… This is going to come across as harsh, but it needs to be said… Most people, at some point in their lives, experience some kind of financial hardship – it happens, business starts to decline, someone gets sick, it’s simply life. We have had financial ups and downs over the years, but you sure won’t find any of that on Facebook. I know of more than a few educators that have lost their business, and even their homes, and they made a comeback…often times not through weddings, but by going the workshop route. I’m not going to say that everyone who has fallen on hard times is a bad educator, that would be completely unfair. But if they have put their financial downfall “out there” online, it is worth looking into the circumstances. There might be others who have more successfully balanced their business and personal life who would make for a better investment. In recent years, some big names in the industry have gotten caught in lies or plagiarism. They claim they “cracked under the pressure.” And while that may be the case, they put themselves in that position, that “pressure” was self-imposed. I’m writing this because I truly care about & believe in this industry. It can continue to grow and improve the right people at the forefront. And yes, I do believe in forgiveness, people deserve a second chance, but I’m not going to open my checkbook to find out if they truly deserve it. Very informative article to help find the best wedding workshops!! So many great tips to find a legit wedding pro to take advice from! Often workshops are sharing what worked 5 years ago not next year! Exactly Carly & thank you.